Be the first to share your favorite memory, photo or story of Darwin 'Dean' . This memorial page is dedicated for family, friends and future generations to celebrate the life of their loved one. Darwin ‘Dean’ Pevestorf, age 89, of Ames, and formerly of Stratford, died Sunday, October 7, 2018 at Northridge Village in Ames. Per his wishes, he has been cremated. Friends may call at the Schroeder-Reimers Memorial Chapel, at Sixth and Marshall, on Friday from 4 until 7 p.m., where the family will be present from 5 until 7 p.m. Following the visitation, a private family graveside service and burial will be held in the Linwood Park Cemetery, in Boone, at a later date. Darwin Eugene Pevestorf, was born in Bagley, Iowa on March 25, 1929, the son of Joe and Grace (Umbaugh) Pevestorf. The family moved to rural Scranton when Darwin was six and he graduated from Scranton High School in 1947. On January 27, 1951, Darwin married Phyllis Nelson at her parent’s home in rural Scranton. The couple moved to Story County near Nevada, and in 1952, Dean entered the United States Army and served overseas during the Korean War. He was on the front lines and later was a military guard for superior officers being discharged in 1954. Dean farmed north of Nevada until 1967, when they moved to rural Stratford, and farmed until he retired in 2001. Dean worked as a grain farmer and over the years raised sheep, dairy cattle, stock cattle, and calves. He loved farming and raising cattle. Dean was also a rural mail carrier in Story and Hamilton Counties for 30 years. He sold seed for Pioneer Seed for 24 years, served on the Hamilton County Conservation Commission, various church boards, a member of the Masons, Acorn Lodge #601 of Stratford. He and Phyllis enjoyed square dancing and wintering in Texas, where he loved playing shuffle board. 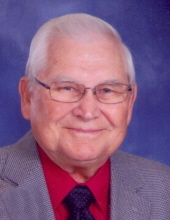 Dean also enjoyed playing cards, golf, and was currently a member of South Marion United Methodist Church of rural Stratford and the American Legion of Ames. He is preceded in death by his parents; a brother, Loren; sisters, Charlotte Hobart and Ruby Springer; brothers-in-law Byron Hobart, Clarence ‘Hap’ Springer, and John Wright; sister-in-law, Norma Wright and nephew, Rodney Wright. Dean is survived by his wife, Phyllis of Ames; daughters, Vickie Carter of Baldwin; Pamela Hasstedt of Windsor Heights; a son, Brent Pevestorf and wife, Liz of Webster City; six grandchildren, Karisa (Stacy) Brown, Tiffany Hasstedt, Krystal (Andrew) Jay, Lindsey (Scott) Harms, Ashley (Ben) Lorenzen, and Jessica Pevestorf; ten great grandchildren, Brennan, Hunter, and McKenna Brown, Tristynn Leon, and Rylie Reese, Avery and Briege Jay, Eastynn Hecht, Briar and Brogan Lorenzen; several nieces and nephews. In lieu of flowers, memorial may be directed to the Iowa Chapters of the American Heart and the American Cancer Societies. To send flowers or a remembrance gift to the family of Darwin 'Dean' Pevestorf, please visit our Tribute Store. The family will be present from 5 pm until 7 pm. There will be a private family graveside service at a later date. "Email Address" would like to share the life celebration of Darwin 'Dean' Pevestorf. Click on the "link" to go to share a favorite memory or leave a condolence message for the family.